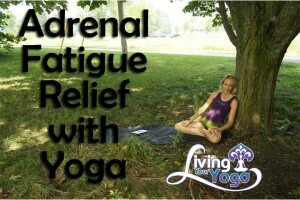 Adrenal Fatigue relief can be helped with this yoga pose. Today’s question comes from Gwen from YouTube and she says, I have adrenal insufficiency. Is there a yoga pose or something you recommend. One of the best poses for adrenal fatigue is legs up the wall or Viparita Karani, it really helps to restore the energy to your adrenals. Here’s a list of the restorative classes on our membership site. Adrenal fatigue is exhaustion from constant stress without sufficient recovery and probably 90% of the population is walking around with it. When your adrenal glands constantly secrete adrenaline and cortisol it makes your heart pound, your blood pressure go up, your muscles tense and you go on high alert. It is imperative that you do things to turn off your adrenal hormones such as restorative yoga classes like. this. Even our most recent class of Namaste Yoga (episode 192) puts a lot of emphasis on restoring your energy.